Hey Love: All About That Bass. Hey babes! Happy Wednesday! I hope y'all have been having a great week! The black jumpsuit. To me, it's kinda like the LBD. It's so versatile, can be worn to many an occasion, and there are so many different versions that you can find one that suits you perfectly. Love the easy wear of the piece. You can just throw it on and be good to go! No complications. Obsessed over that jumper! So Cute. You are ROCKIN' this jumpsuit! Gorgeous heels! Giovanna, you look amazing in this jumpsuit! I love it! I love how you styled it too! I really want to try adding a black jumper to my wardrobe but I didn't want to pay a fortune for one. I love yours, you looks great in it and accessorized it perfectly. Love this jumpsuit! So sassy ;) Great look. Beautiful look!!! So cute and simple!! i love your outfit and those heels are the perfect touch! I love the jumpsuit look! It is such a fun piece! I am totally crushing these great heels you paired with it! You look gorgeous!! I wore a jumpsuit on my blog yesterday, I am in love with them! Those shoes are perfection! So in love with this romper on you! Perfection! This is perfect, that jumpsuit is too too cute and I love those heels with it! Amazing look, love everything, especially the golden details and leopard pumps ! love this jumpsuit, you look too cool!! 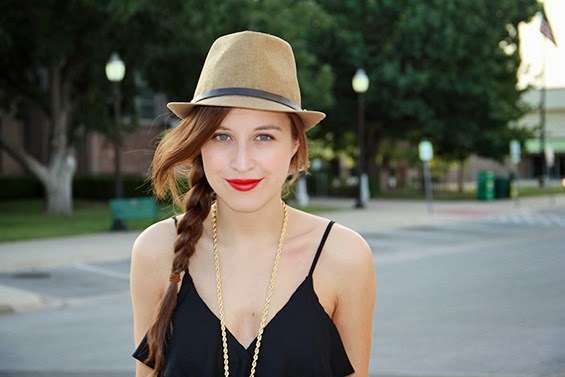 the pop of leopard and fedora were the perfect additions! !